I think it’s safe to say that spring really has made it to Boston. There were a few weeks there where I thought winter was gone for good, only to wake up the next day to 40 degree weather. I’ve been dressing awkwardly these past few weeks, unsure as to what the weather would do, and have consumed an eclectic menu, not knowing whether a hearty soup or a crisp, spring salad would be more appropriate. I’m not quite used to this weather, where it isn’t really consistently warm until mid-May. In Arkansas, you’re lucky to get spring weather. There’s usually a mix of snow and nice weather in March, rain in April, and then summer is in full swing by the time May rolls around. Besides for this year, when it was 80 degrees one day, and snowing the next. I think my hometown saw more snow this month than they did all winter long. What’s up, mother nature? It’s warm in Boston today. Really warm, actually. It’s one of those days where nothing suits you but a dress, and if you have a grill, that’s where you will be cooking your dinner. There’s no place for us to grill at our apartment, unfortunately, so I am forced to get creative. We slept with the AC on for this first time last night, and I woke up craving the flavors of spring. I settled on a bowl of granola for breakfast, but insisted on some spring flavors for my post-workout snack. 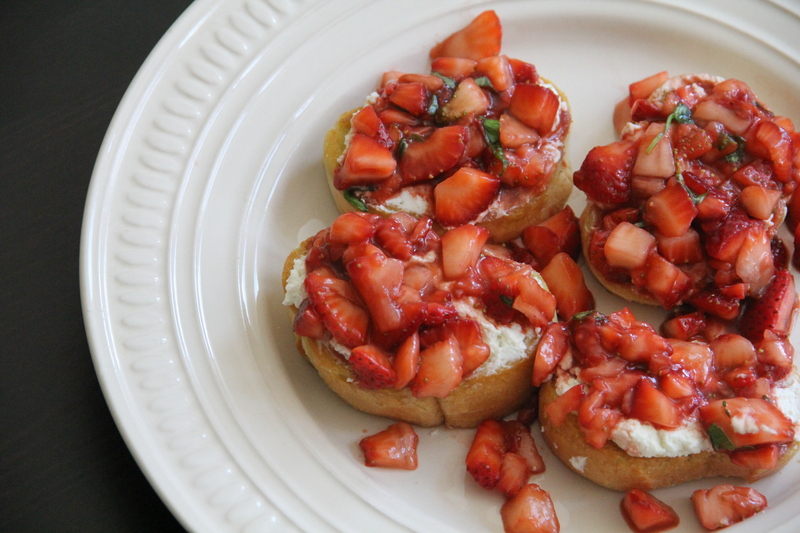 This bruschetta could almost be a dessert, really. Add some sugar to the goat cheese and you’ve got yourself a sweet and savory snack. That’s not the route that I took, though, as it wasn’t sweets that I was craving. I coated the berries with some fancy olive oil and vinegar that I picked up this weekend at a local olive oil company. I tried about 20 different flavors, some exotic, some a little less exciting, before finally purchasing a bottle of basil olive oil and strawberry balsamic vinegar. I originally felt a little boring by my choice, but am not regretting it one bit after making this dish. My snack ended up turning into a meal, as I couldn’t stop at just one piece. The hubs and I ended up devouring most of the batch for a nice spring lunch. I had intended to serve it as an appetizer with tonight’s dinner, but it doesn’t look like that will be happening. Whoops…! Mix strawberries, strawberry balsamic vinegar, balsamic vinegar, and 1.5 teaspoons of basil olive oil together in a medium bowl. Add a splash of lime juice, a sprinkle of sea salt, basil, and a bit of thyme, if that’s your thing. Set aside. Heat 2 tablespoons of olive oil in a large, heavy skillet over medium heat. Add your bread, toasting lightly for 2-3 minutes per side. Meanwhile, mix together goat cheese and 1 teaspoon of basil olive oil in a small bowl. Add another sprinkle of sea salt, if you desire. 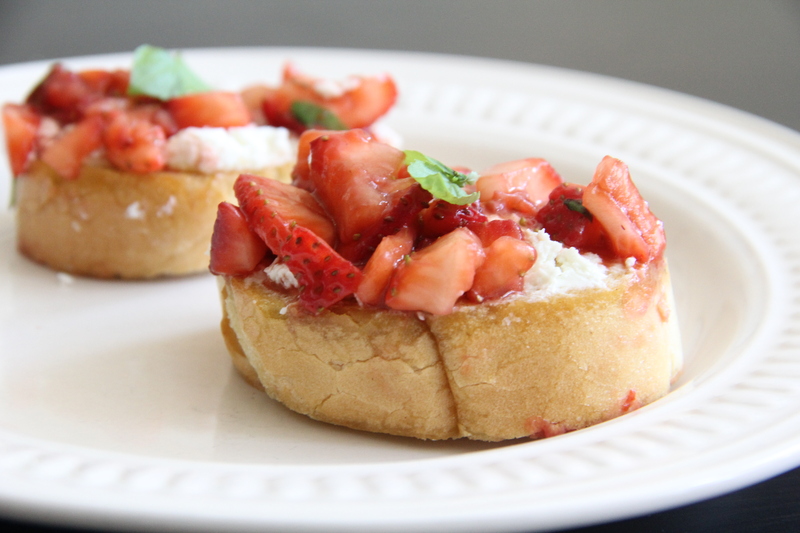 Once your bread has finished toasting, spread with goat cheese and top with a heaping spoonful of strawberry mixture. 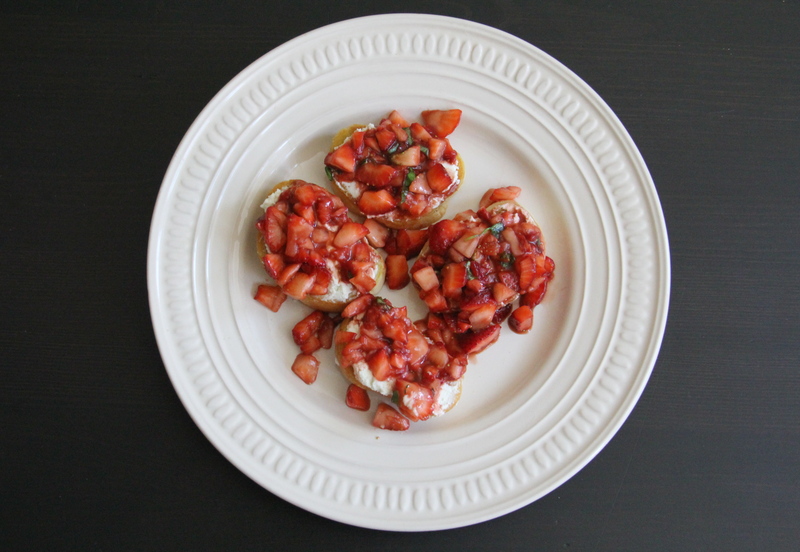 Serve as an appetizer, a side, or if you get too excited, eat it as a meal like me!